TaskUs, headquartered in Los Angeles, and best recognized by Inc. 500 as one of the 5000 Fastest Growing Companies in America, is rapidly expanding in the Philippines today. It currently has 7,500 employees and five sites, and is best known as the “secret behind the phenomenal scaling of some of the world’s companies,” such as Twitter, Groupon, Tinder, Shopify and Whisper, among others. 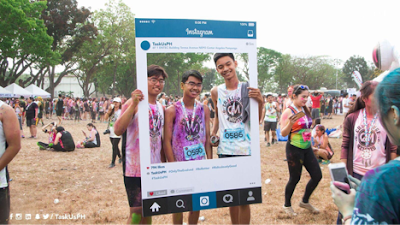 Known as ridiculously good at powering tech startups; it has partnered with Color Manila, the country’s most aggressive ‘concept fun-run’ organizer, for its CM Challenge Run held last March 19 at Clark Parade Grounds in Pampanga. The partnership makes perfect sense, “As a company that cares deeply about affecting people in meaningful and revolutionary ways, TaskUs finds a kindred spirit in Color Manila, as they find purpose in bringing color to people's lives. We genuinely care about our employees' overall well being, and this includes their physical and emotional health. Work-life balance is important, so a colourful fun run that defies norms and gives people the opportunity to not just explore an avenue for healthy recreation but also create connections with other human beings who enjoy the same things, is something that we definitely support,” says Rey Salazar Jr., Brand Director of TaskUs. “TaskUs today is expanding rapidly and has transformed to something more than just a company. It is a movement. We change what it means to work in this industry; not by idly accepting the status quo, but by taking smart risks, and finding new ways to do things better," adds Ma. Isabel Bernal, VP of Culture. See a TaskUs site to open in Batangas City this March 2017.